In order to survive this journey through brain injury I think you need to have some sort of faith. Faith is a very personal thing and yet when brain injury occurs it is often questioned more than ever. Most people question their faith after a brain injury, but for me, it was quite the opposite. You see before my daughter, Isabella, got sick with sudden acute encephalitis, I already had doubts about my faith. The two years prior to Isabella’s Acquired Brain Injury (ABI), I had helped care for my Nana who was dying from ALS. I watched the woman that I called my Nana, who was more like a mother and best friend to me, suffer for about two years. It was heartbreaking and it made me question my faith. My Nana was one who always had a strong faith yet she was suffering. At the same time that my Nana was dying, one of my best friends, Jillana, was losing her battle to an inoperable brain tumor. Once again my faith was being questioned. Jillana was a young athletic amazing person and yet she was suffering from this horrible brain tumor. My Nana died Sept 2009 and Jillana died March 2010. Within 6 months I had suffered two substantial losses. I was angry and upset that two great people suffered and died. I was questioning my faith; I was questioning everything that I had ever believed in. I found myself searching for a reason to have faith because I no longer believed. I didn’t believe in prayer because I prayed so much for them both. I did not believe in people that claimed to have experienced miracles. In my mind, people that claimed to have miracles were not telling the whole story and clearly something else played a hand in that “miracle”. When Isabella got sick everything changed. I found myself in the PICU watching my child dying before my eyes. I was praying to anyone that was listening to please save my baby. In that room I didn’t know what else to do so I prayed. There was family, friends, acquaintances and strangers from all around the country praying for Isabella. Then in the words of her doctors, a miracle happened. Prayers were answered. Not only did Isabella survive but she defied the odds. Hearing doctors say that there is no medical explanation for her survival and that it is a miracle she is here, well, that gave me something to think about. I had watched a miracle with my own eyes and there wasn’t more to the story as I had often suspected with others who claimed miracles. As the hours turned to days then months and eventually years I could feel that my faith was returning. I had faith to understand that the power of prayer really does work and miracles really do happen. Not all prayers are answered how I want them to be but I now have faith that somehow some way things will work out. Ironically that was something that my Nana had told me my whole life that I didn’t understand until Isabella got sick. On this journey my faith has been tested over and over. What I have found is that faith comes in all kinds of packages. There is faith in the power of prayer, and faith in miracles. I have faith that Nana and Jillana are our guardian angels, both never far from us. Faith can also be found in doctors, therapists, friends, family, strangers and support groups. Faith isn’t always this thing that is right in front of you; sometimes you have to really look for it. Most importantly I have faith in Isabella and myself. I know that together we can conquer any battle big or small. After all faith helped us survive the unimaginable. 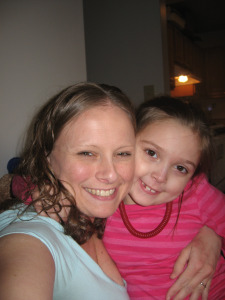 Guest Blogger, Kristin Olliney, is the mother of 8-year-old Isabella, who suffered sudden acute encephalitis when she was just 4. Kristin’s bi-monthly blog, Mommy of a Miracle, talks about the trials and joys of raising a brain injury survivor. This entry was posted in Advocacy, Caregiver & Family Member Support, Education, Mommy of a Miracle, Survivor Story, Survivor Support, Uncategorized and tagged #faith, #inspiration, #Mommyofamiracle, BIA-MA, brain injury, brain injury association of massachusetts, caregiver support on July 14, 2014 by Brain Injury Association of Massachusetts.